With Bonfire night fast approaching, we’re getting ready to pull out our fluffy gloves for a fun filled night of fireworks and writing our name with sparklers! There’s something really magical about sparklers and when photographed correctly, they can really add something to a photo. So, this year, rather than just enjoying the firework display, why not take your camera out with you and try to capture some sparkler photos of your own? Below is an easy-to-follow guide on how to alter the settings of your camera to achieve the perfect sparkler photo! First you will need to purchase your sparklers. We recommend stocking up with plenty as it is likely a few will go to waste while you are trying to master your technique! If you can, buy the longer ones as they last longer, which will give you more writing time. Before you get started, you need to have your Camera on all the correct settings. 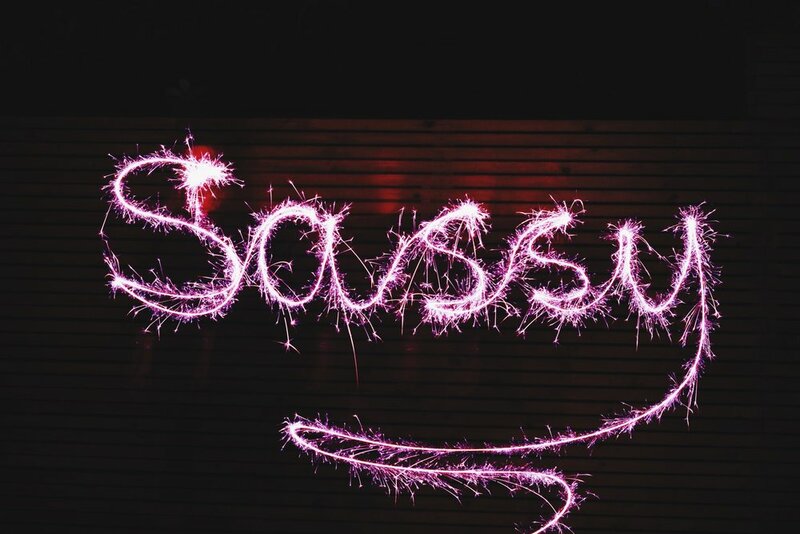 Put your camera on ‘Shutter Priority Mode’, this will allow you to control the shutter speed (which is the amount of time the shutter stays open, allowing you to capture the whole word or image you are creating with your sparkler). Depending on how long the word is, the shutter speed should probably be around 5-10 seconds long. For longer words, 10 seconds will give you time to write the whole word. But have a play around and see what works best for you. You will also need your camera to be kept steady when taking the photo so if you own a tripod, this will make your life a lot easier! Ensure it is nice and tight so it doesn’t budge at all when you release the shutter button and move your hand away. Although you are using a tripod, you will still need another pair of hands on board - one for writing, one to work the camera! The person writing needs to be positioned in the correct spot before you start. Make sure the focal length of the camera is wide enough to capture the whole word and that they are standing in the centre of the frame, facing the camera. This obviously needs to be done in the dark so the background shouldn’t be visible, but, double check there are no distracting objects in the background such as lights that may throw off the exposure of your image. This is probably the part that will take the most practice so before you actually light the sparkler, practice writing your word. Remember that the word will need to be written backwards for it to show the correct way on camera. The person writing will need to reach their arm out to the right and write the word right - left. If this is a struggle or the writing is looking messy, you can always flip the photo afterwards. Once you have everything in place, it’s time to go! Make sure the writer is holding the sparkler in the position they plan to start the word, then the cameraman should light the sparkler before dashing back to the camera to press the shutter button. Voila! There you have it, a beautiful sparkler photo ready to post on November 5th! Let us know below in the comments how you get on or if you have any other tips for long exposure photography!